According to clinical psychologist Kay Redfield Jamison, "Children need the freedom and time to play. Play is not a luxury. Play is a necessity." I agree. That's why I encourage messy play. 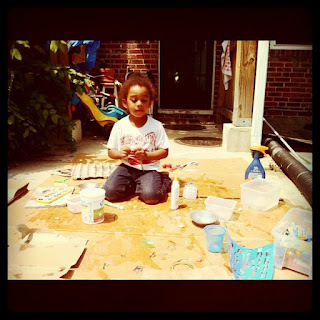 A marvelous mishmash of paint, water, cornmeal, or mud gives kids seven important benefits you and they will appreciate. Last week, my daughter came home upset and stressed about her day at school. We grabbed play dough, and she played until she felt relaxed. Messy play does wonders to produce calm and reduce stress as kids create, receive sensory stimulation, and have fun with no rules or expectations. Messy play is one of my favorite ways to teach my girls scientific skills. Even if they don't grow up to be scientists, they can use beans, blocks, and rocks to understand matching, identifying, weighing, and ordering. I also appreciate that they learn to ask questions about the world, think outside the box, and understand cause and effect as they make slime, play in the garden, and jump in puddles. Every kid needs to learn motor skills that allow them to run, button their own shirt, and hold a pencil. There are dozens of fun and messy play activities that teach motor skills. Kids can squeeze paint out of ketchup bottles, pour blocks from one container to another, and stir sand, grass, and dirt in a bucket as they play and learn. There's no "right" way to do something when it comes to messy play. While playing with clay today, my daughter made spaghetti and her friend molded a crown. Your kids can do the same as they express their interests, talents, and personalities while engaging in messy play and doing their own thing. Kids have plenty of opportunities to communicate while they play. They can listen to a friend talk about how she's going to splash in the water like a mermaid, and they can share what they'll make with the sand. Messy play also helps kids negotiate, share, and take turns, three essential communication skills I think every child should know. A neighbor gave us a huge box of expired pudding cups last summer, and I gave it to my girls and told them to paint the porch. They had so much fun as they painted smiley faces, doodles, and each other. That messy afternoon boosted my girls' creativity and imagination. It encouraged them to think outside the box as they used an unusual paint medium. That creativity will help them succeed in life. I decided to repaint the play room last year and vowed to get my girls involved. We had so much fun! They picked out wall paint colors, researched and chose different objects like sponges, potatoes, and stamps to add texture to the walls, and helped paint. That messy play opportunity taught them about colors, mixing, and texture, and now they point out subtle colors and new textures on nature walks, in the grocery store, and everywhere we go. As parents and caregivers, we can encourage messy play and its benefits. I know I plan to blow bubbles with my girls after dinner tonight. What marvelous mishmash will you and your kids play with today?